If you plan to visit Hong Kong from the airport, and return within 24 hours, you have two options. The first is the fastest. You take the airport express from the airport right into the city and take it back. If you return on the same day, it costs just HK$100. If you're returning on the next day, it's a little more. You'll also need to pay for local transport within the city, but for the most part you can just walk around. Now, if you're willing to take a little longer, but want the cheap way, then what you should do is get the S1 bus from the airport to Tung Chung station. Ticket price: HK$3.60. Note, don't take the S64 because that takes you on a tour of rather uninteresting places. Once at Tung Chung, buy a tourist day pass, valid for 24 hours from first use. Price: HK$55. 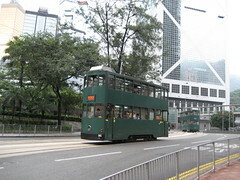 You can use this day pass to get in to the city, and all around on the the MTR and light rail. The ticket comes with a small subway map that you can use to navigate. You'll take the Orange (Tung Chung) Line in to the city, and get off wherever you want to. To go around the island, get off at Hong Kong and then walk to Central and take the Blue (Island) line from there.